In my travels, I cover a lot of new ground. 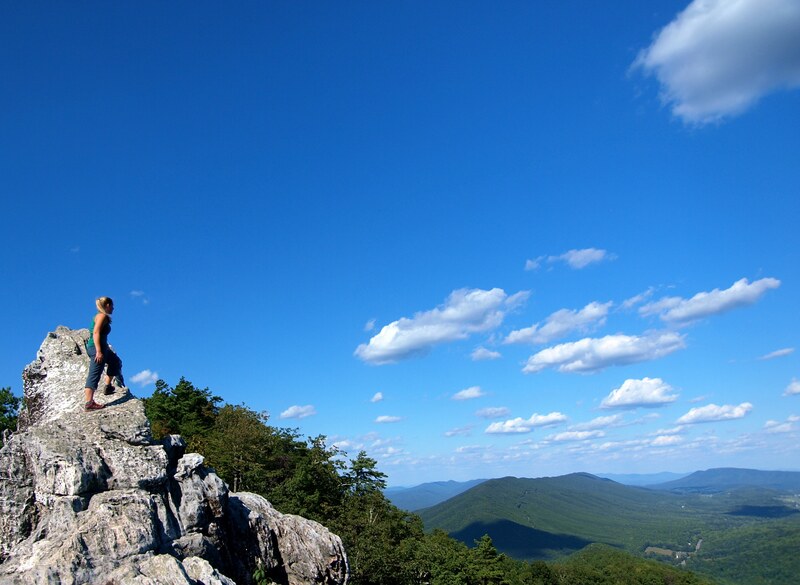 Just recently, I threw a dart at a map of the Appalachian Trail in Virginia and landed in a gorgeous never-before-seen section, replete with wide open vistas and wild ponies. I live for discovering fantastic new places, but I also love returning again and again to old favorites, getting to know them on foot, in all seasons and in all weather. 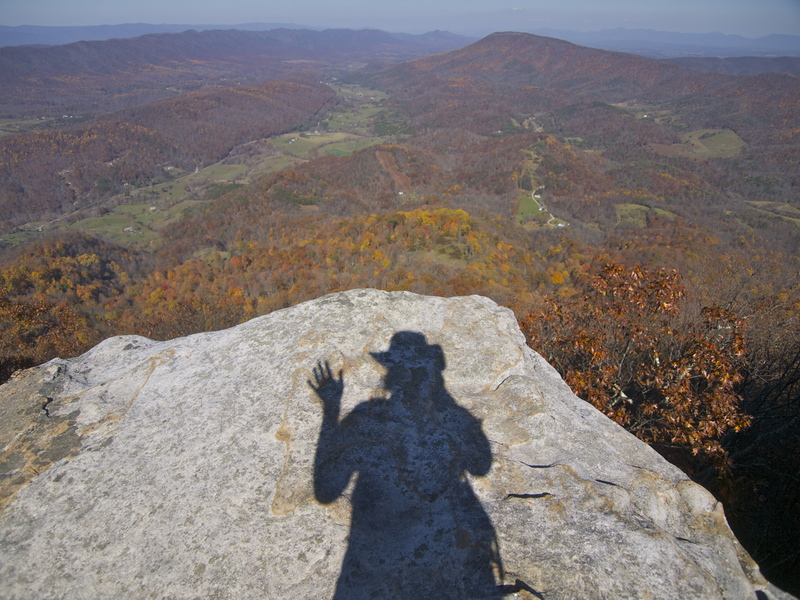 Last week I revisited a spectacular overhanging cliff along the Appalachian Trail near Catawba, Virginia known as McAfee Knob. 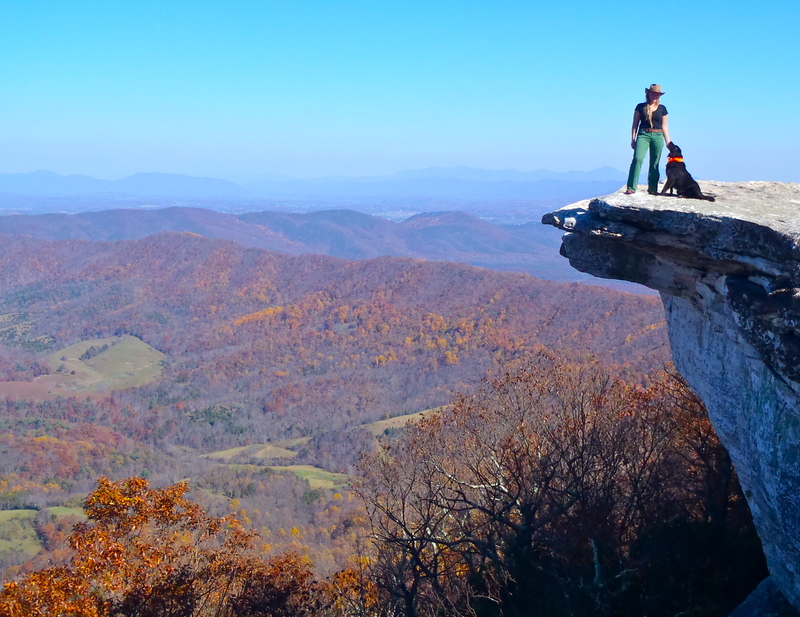 McAfee Knob isn’t just any overlook; it’s THE overlook, widely considered the most photographed spot on the Appalachian Trail. 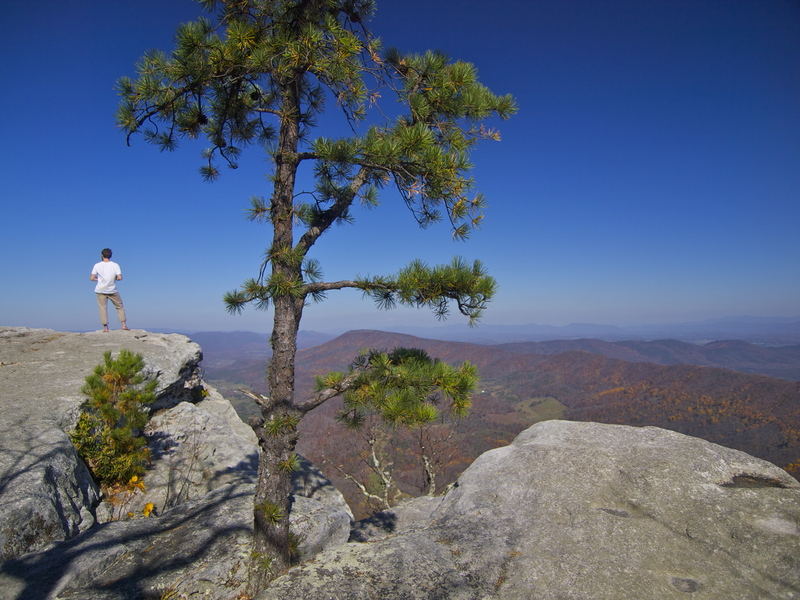 Before last week, I had hiked to McAfee Knob twice, in 2005 and 2008, both times on multiday backpacking trips on the 35-mile section of trail between Blacksburg and Roanoke Virginia known as the “Triple Crown”. 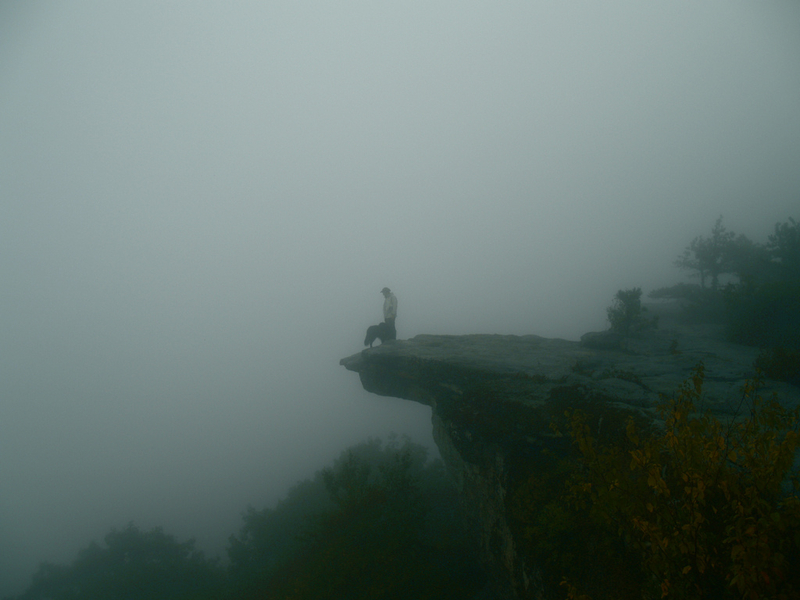 Traversing three spectacular overlooks – Tinker Cliffs, McAfee Knob and Dragon’s Tooth – this scenic trek is so resplendent that I consider it one of my top five hikes of all time, despite having only ever hiked it in the pouring rain. My first hike on the Triple Crown was also marred by the loss of my beloved Pentax old school film camera. At the end of our trek my friends and I hitched a ride back to our car with a kindly stranger and in the rush to gather all of our gear I somehow left my camera behind in his trunk. I’m sure that good samaritan would have returned my camera if he could, but we didn’t even know each other’s real names. I was heartbroken, but my friend Boot put things in perspective for me by saying, “At least you didn’t lose your dog.” Amen. Now having returned to Virginia, I was determined to revisit McAfee, but this time I was going to wait until a banner fall day. Last week, I got it. I spent the morning racing self-imposed deadlines and watching leaves fall outside my window. At noon, I quit, drove south, parked along highway 311 and headed north on the Appalachian Trail 3.9 miles to McAfee Knob. As I hiked, fall fell all around me, swirling and swishing ankle deep along the trail. 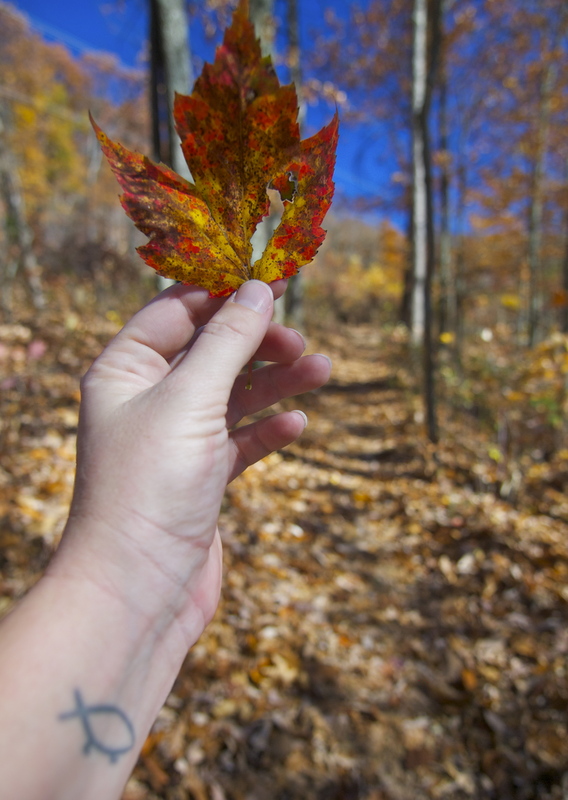 Mid-stride, I caught a few bright leaves in mid-air, aiming high for the red maples and yellow oaks. Just below the summit, I overtook a heavy, wheezing man, going up. He was carrying nothing but his own bulk and sweating profusely. I started a conversation, giving us both an excuse to rest and offered him some water. At first he declined, but once I explained that I was carrying extra for the dogs but there was a spring and they didn’t need it and it was weighing me down, he relented, sat and sipped. “Mike” was from Jolo, West Virginia, the “snake-handling capitol of the world,” he told me, with pride. I perked up. “Are you a believer?” he asked me. “No sir,” I said, grinning my most conversation dismantling grin, “I’m a rattlesnake wrangler.” He smiled, fully disarmed, handed back my water bottle and wished me Godspeed. I much prefer Dogspeed, but whatever gets us up our own mountain. 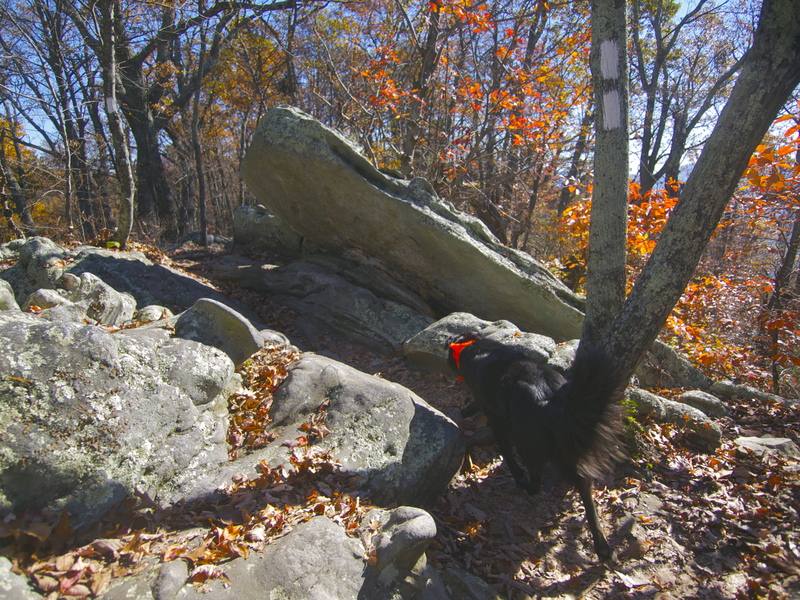 Standing on the summit of McAfee, overlooking southern Virginia’s picturesque foothills and pastoral farms, a gust of wind blew a flock of leaves up towards the cliffs. One chestnut leaf soared right at my face and I plucked it out of the air, marveling at my good fortune: on this day, my third trip to McAfee Knob, I was in exactly the right place at the right time. Dogspeed, indeed. 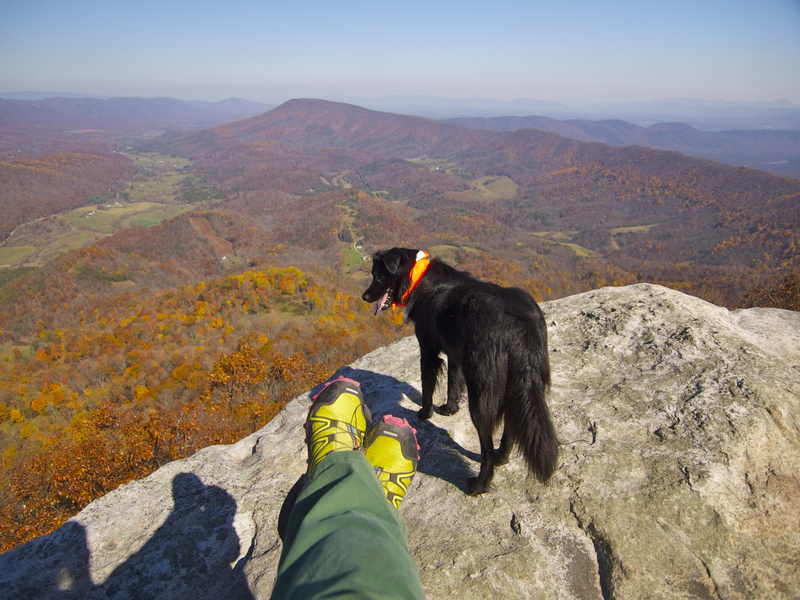 This entry was posted in Appalachian Trail, Bowie & D.O.G., Hiking!, Photography, Uncategorized, Vagabonding 101 and tagged appalachian trail, Dragon's Tooth, McAfee Knob, overlook, Tinker Cliffs, Triple Crown. Bookmark the permalink. 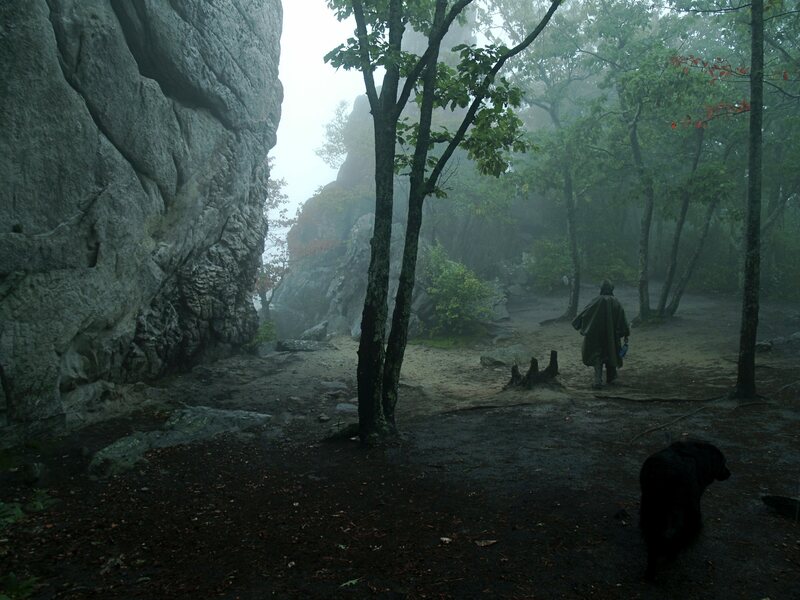 Awesome picture at McAfee’s Knob. 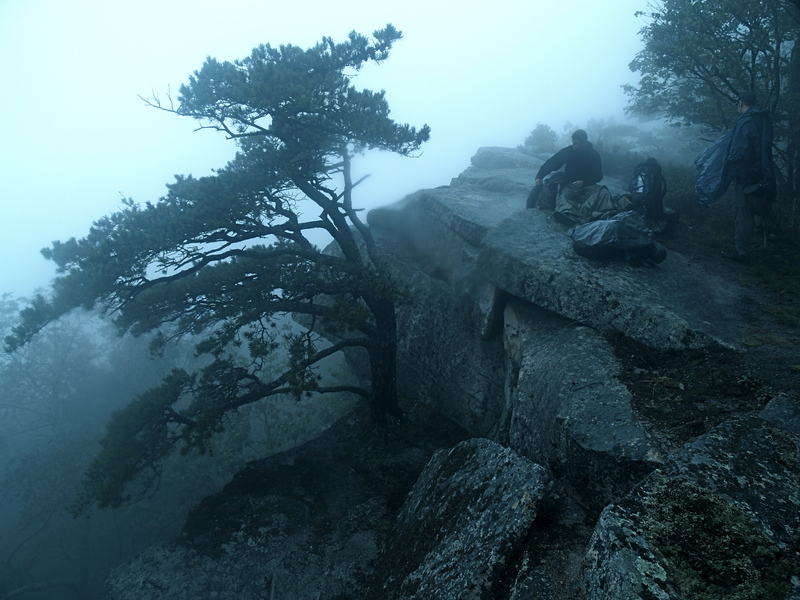 It must be an interesting experience to see the same spot surrounded by fog and then in the light. I really enjoy your hikes! I had a beautiful day there in 1997 when I thru-hiked as well. The picture that I have is a lot like your 2008 shot where I set up my crappy little camera and then ran like hell to get the self-portrait. That was such a great day, I remember it well. Thanks for lighting up that part of my brain that loves to recall the Trail.